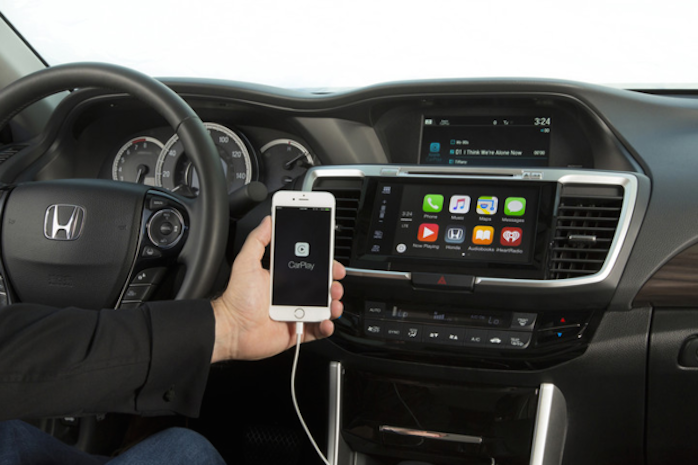 Apple today released a complete list of car models that now natively support the use of its CarPlay iPhone mirroring interface. Apple's list of CarPlay-enabled vehicles includes over a hundred 2016 and 2017 models from 21 auto manufacturers, including Audi, Buick, Cadillac, Chevrolet, Citroën, DS Automobiles, Ferrari, Ford, GMC, Honda, Hyundai, Mercedes-Benz, Mitsubishi, Opel, Porsche, Peugeot, Seat, Škoda, Suzuki, Volkswagen and Volvo. CarPlay allows users to replicate their iPhone's look and capabilities on a car's central console through the use of hands-free and eyes-free access to Apple Maps, phone, messages, iTunes and many third-party apps such as iHeartRadio and Spotify. Compatible with iPhone 5 or later models running iOS 8 or above, CarPlay, also enables hands-free use of Siri, Apple's voice-enabled assistant. Notably missing from the list were car manufacturing giants such as Kia, Nissan and Toyota. Ford was listed as having only one future model in support of CarPlay: The 2017 Ford Escape. However, Ford announced at CES last week that its Sync 3 infotainment system will support both Android Auto and Apple CarPlay in 2017 and it's only starting with the Escape. How Android Auto will look in Ford vehicles with Sync 3 beginning in 2017. "With Sync, we move at our customers' pace -- making it easy for them to maintain a connected lifestyle no matter their choice of smartphone, apps or services inside and outside their vehicle," Don Butler, Ford's executive director of Connected Vehicles and Services, said in a news release. GM topped the list with 35 models (including 10 Cadillacs, five Opels, four GMCs and two Buicks) that support CarPlay. With 18 models, Volkswagen came in second with the most models that support CarPlay. 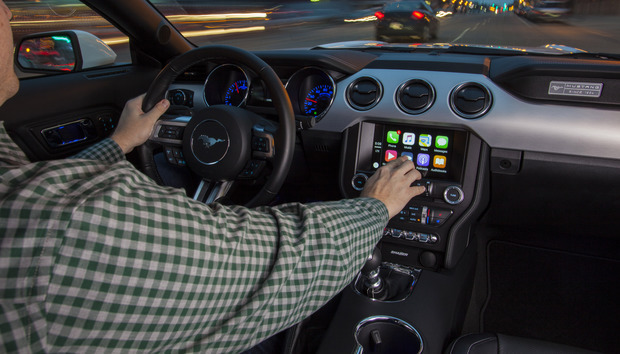 Apple's CarPlay and Google's Android Auto will be adopted as native interfaces, or smartphone mirroring applications, across the carmaker community, according to IHS senior analyst Jeremy Carlson. And it won't be one or the other -- it will be both. "CarPlay and Android Auto are already drastically undermining the native" in-vehicle infotainment (IVI) system makers, Carlson said. "This is one of the biggest disruptions to the [IVI] space. Even if you look back on personal navigation devices, this is much more fundamental. Being able to bring content into the [IVI] with smartphones...really does fundamentally change what consumers want" in their cars.